I write this tribute in honor of my friend, Sherifa, a young woman who taught me more than most about the culture and lifestyle of Qatar. My hope is that Sherifa’s voice and sentiments live on in the dreams of other young Qatari women. 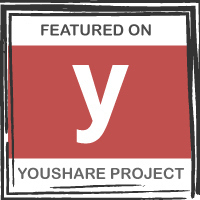 This article recounts several interviews I had with Sherifa. 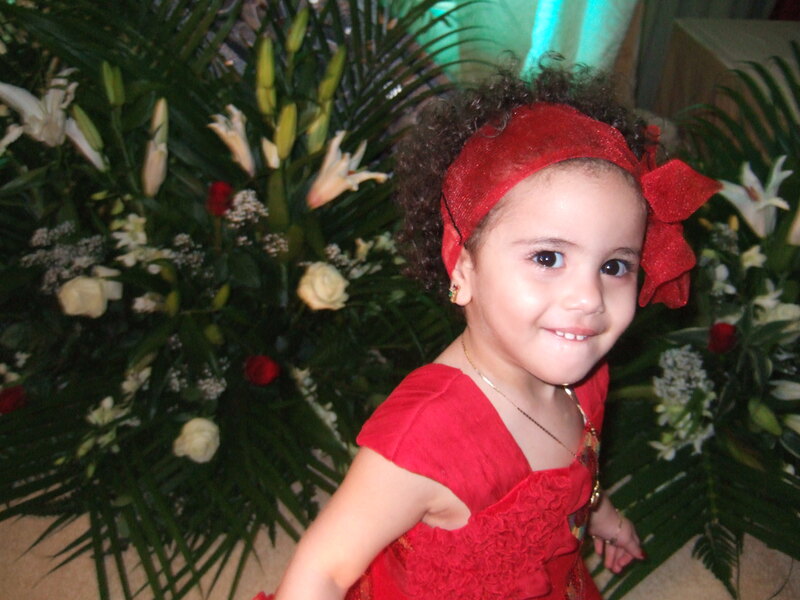 Sherifa died in a tragic car accident on November 22, 2013 on the precarious, and sometimes perilous, streets of Doha. She had turned 23 just a week prior to her car accident. 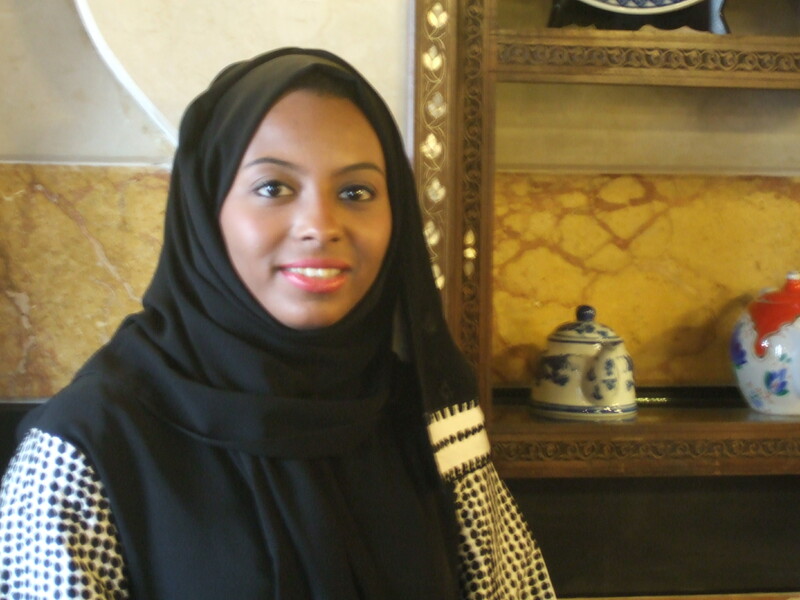 Sherifa, who received her law degree from Swansea University in Wales only months ago, had a dream to become one of the first female judges in Qatar. This young rising star was the eldest of five children, and was cherished by family and friends. Short in stature, Sherifa’s candid charm, infectious spirit, and commanding manner always filled a room. Sherifa loved her Smart Phone, texting, and shopping at Doha’s malls for designer jeans, handbags, and shoes, yet regularly stood up for those less fortunate than herself. I was frequently disconcerted when Sherifa routinely ordered for the entire table when my husband and I joined her and her family for dinner – a highly unusual action for a young woman in the Gulf region. Sherifa’s forthright actions say not only a lot about her own nature, but the unique environment in which her parents raised her. Sherifa, who defied all stereotypes, was bold and resolute, yet compassionate and a realist. I first met Sherifa in February of 2009 when I was looking for female Qatari university students to interview for a series of articles focusing on the role of women in the Arabian Peninsula, the effects of western influence on the everyday lives of young Gulf Arab women, and concerns around balancing career/marriage/family in a changing region. Five young women, three of whom attended Northwestern University-Qatar and one at Virginia Commonwealth-Qatar, graciously agreed to be interviewed, Sherifa (who attended Swansea) among them. Immediately following our initial interview, Sherifa insisted I go to her home to meet her family and experience some “real Qatari hospitality.” That very evening I found myself seated on a bright red overstuffed loveseat being served cardamom coffee and Arabic sweets on a silver platter by Sherifa herself in the luxurious sitting room of her home. I had the pleasure of meeting Sherifa’s mother, father, as well as a younger sister and brother. Later in the evening, my husband, Bishara, and I met Sherifa and her parents at Villagio (an upscale mall) for coffee, the beginning of a deepening friendship between Sherifa and her family, and Bishara and me. We had an instant “cellular” connection. Feast at desert family farm. When speaking of family, Sherifa often became animated. “It’s written in our religion we have to be bonded together by family, because this is how we’re going to survive in life,” pronounced Sherifa. “We need someone to share with us our happy moments, sad moments, to be around, you know.” Families, immediate and extended, gather often in the Gulf States, and cousins are particularly close, meeting often on weekends at a family home where they might dance to Khaleeji music, watch movies, divulge secrets, or decide to go out to a mall. Sherifa highlighted the value placed on family connections and Fridays, in particular, that are “like a holy day for us, when we get together to see our parents and other relatives. Like we go to my grandfather’s house. Sometimes we eat lunch there, and all the males in the family go to the Mosque together, and the females go to my grandfather’s house where my aunts prepare lunch together, and then we sit together and eat.” Sherifa added that her family sits “on the floor, on the carpet, the traditional way,” eating from large communal trays. 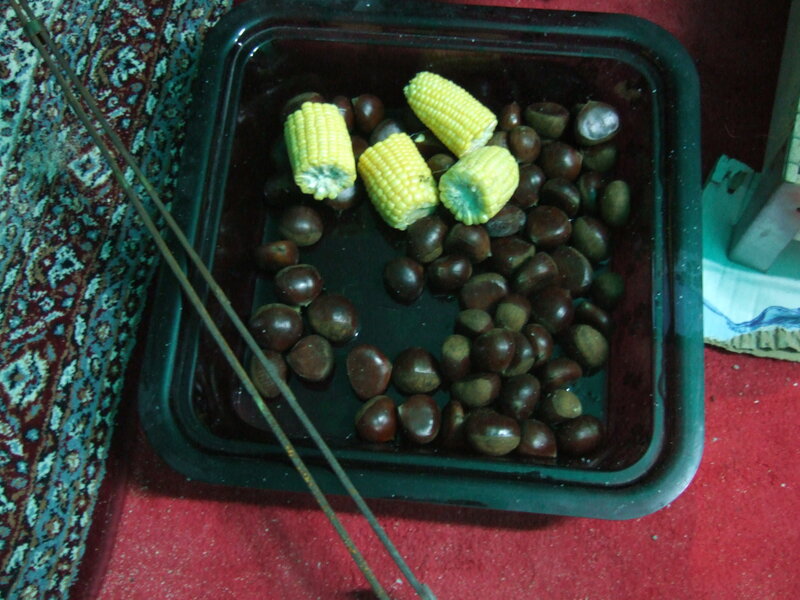 Roasting corn and chestnuts in women’s tent. 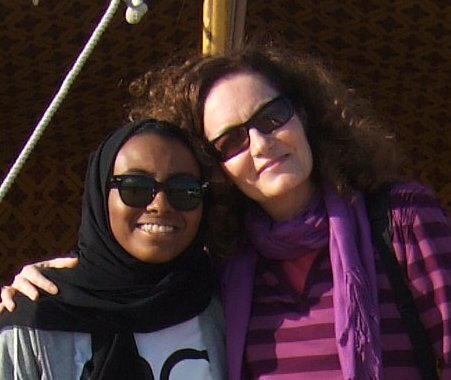 Me and Sherifa at family farm outside of Doha. Sherifa’s legacy lives on in the four other young women I interviewed alongside Sherifa, (including Fatma I., Mouza, Sarah, and Fatma A. ), and others like them, as well as in Sherifa’s two younger sisters, all of whom are smart, courageous, forward-looking and undaunted. Qataris and women from other Gulf Arab nations do not have the luxury of trolling for mates on popular dating sites such as Match.com. In a region where signs of progressive, western influence are everywhere, the dating game remains steeped in centuries of tradition. My husband and I relocated to Saudi Arabia from Washington, DC in 2000, and later to Qatar in 2004 to pursue a new life and career opportunities. As a writer, I have made a concerted effort to become familiar with the region’s customs, trends, and most significantly, its people. In my venture to learn more about the young women of Qatar, in particular, and how they negotiate the creep of westernization with age-old Arab traditions, I interviewed a group of young female Qatari students. Among the variety of topics we discussed, dating and marriage drew strong reactions. On any given night in most American cities, nervous and excited single men and women gather in boisterous sports bars and crowded restaurants. Amidst the white noise of unyielding chatter or televised basketball games,people pass between one another, doing their best to crack jokes and make a great first impression in the hopes it may lead to that coveted first date. Little do they know that halfway around the world their Arab peers are experiencing their own, much different version of dating. For most Arabs, courtship unfolds in a pragmatic, systematic manner. However, specific customs vary broadly by region. For example, conservative Gulf region countries, including Saudi Arabia, Kuwait, Qatar, United Arab Emirates, Bahrain, and Oman follow conventional dictates of arranged marriage rituals in the Arab culture. These six nations with ties going back to the ancient Najd Arab tribes of Saudi Arabia, or Yemen, ascribe to “khaleeji” culture: each country shares the same dialect, clothes, food, music, and the more traditional courting customs. Gender segregation plays a role in this mindset. Sherifa, like many young, unmarried Qataris, spent most of her formative, adolescent years with other girls before entering college and the world of co-ed campuses. I asked the other women for their responses to Sherifa’s opinions, wondering if they shared her traditionalist notions. Fatma, a twenty-two year-old, well-spoken Qatari woman studying journalism at Qatar Foundation’s Northwestern University offered, “Well, I wouldn’t go for an arranged marriage blindly. I’d rather know the guy from school, or work, or actually have had a conversation with him, you know, not real dating, just you know publicly and then having him go to my parents.” Mouza, also attending Northwestern University in Qatar, chimed in, “It’s like big proof that they love you, if they go to your parents when they propose.” The other girls nodded in assent. The closest thing to dating in Gulf countries takes the form of a pre-marital meeting between the bride and groom that takes place in the bride’s home within direct view of family members. In contrast, Arab countries outside of the Gulf region, particularly countries like Lebanon, Syria, or Jordan exercise greater leniency regarding the tradition of arranged marriage. In some cases, young men and women have a say in the selection of a marital partner. Despite this courtship liberalism, dating normally becomes restricted to public places with a chaperon in tow, usually from the bride’s family. Whether inside or outside the Gulf region, courtship and matrimony are deeply intertwined with the concept of family; kinfolk take intimate roles in nearly every step of the courtship process. The business of seeking out a potential female mate for nephews, sons, or grandsons typically falls to aunts, grandmothers, and mothers. This community of women may also make the initial contact with the prospective young woman’s family, usually her mother. Fathers, however, sign the final marriage agreement, along with the bride and groom and witnesses. To westerners, this practice may seem oppressive or even overly intrusive. However, for couples in the Gulf region, this hands-on involvement often strengthens family ties and brings the benefit of parents’ experience to the new couple. According to the young Qatari women I interviewed, weddings, parties, and other gatherings are all common venues for this important search. “Women only” weddings provide a particularly good opportunity for these family members to “scout out” potential marriage material. These weddings find scores of unmarried young women glamorously attired in formfitting, low-cut, luxurious gowns, gyrating the night away on raised platforms in the center of overflowing ballrooms to popular Arab music. If a young lady is lucky, her mother may just receive a call the following day from a wedding participant. If there is a good vibe between the women this normally leads to the next step in the process: protracted family meetings. In Qatar and the Gulf nations it is compulsory that families of the bride and groom communicate or meet first, before the prospective bride and groom are introduced, in order to determine the suitability of the union. These meetings precede the Khutuba, or engagement ritual; the Melcha (Aqed Zawaaj), the marriage agreement/contract; and ultimately the wedding celebration. The visits between the families provide the time to probe the laundry list of desirable characteristics from the appearance and personalities of the prospective mate’s family, to the career of the father and rest of the family members, to the family’s wealth: The groom’s father is an engineer, for example; this bodes well in the bride’s mother’s eyes. The bride has a brother working at a prestigious law firm in London; this gives the groom’s father a confident feeling about the match. I originally published this article in The Liberator, September 2009. I turned the wedding invitation over in my hands, caressing its lavender velvet. In the filtered sunlight of the villa courtyard, the gold Arabic script laced over in elegant calligraphy seemed to shimmy, and the tiny mirrored gems sprinkled along the folds winked seductively up at me. I felt a flush of pleasure as I visualized myself, an expatriate Cinderella, finally asked to the ball: a “women only” wedding. This distinctly Arab ritual united women in unadulterated euphoria, celebrating and honoring the marriage ceremony, a particularly sacred experience in Arab culture. Despite being exposed to many novel cultural experiences during my four years living in Saudi Arabia and over three years in Qatar, attending a “women only” wedding remained a particularly poignant desire of mine. Almost compulsively drawn to places, people, and experiences that swept me away from the conventions and comforts of my western culture, I found this innate kinship with foreign locations and customs responsible for shaping much of my adult life, including my eventual decision to leave Washington, DC, my home of 17 years, and to relocate to Saudi Arabia with my husband. Only the most traditional of Arab families continue with the practice of “women only” weddings. As the name suggests, “women only” weddings are reserved for females, allowing the bride and her family and friends to celebrate the cherished nuptials free of the restrictions that are faced in everyday life such as wearing the obligatory abaye and headscarf in public. In conservative Arab families it is forbidden for women to be seen “uncovered” by a male other than an immediate family member. Until now, l had lived vicariously through the experiences of my Arab and expatriate women friends who filled my visions of these celebrations with Arab women adorned in lavish gowns, dancing with frenzied abandon until dawn, and feasting upon the seemingly limitless banquet of fine cuisines served late in the night. Feeling like a 16 year-old who had just been asked to the prom, I gently clutched the invitation close to me and hurried inside. The laundry list of my daily errands and chores evaporated in the scorching noon sun as I mentally scanned my closet, what to wear?! 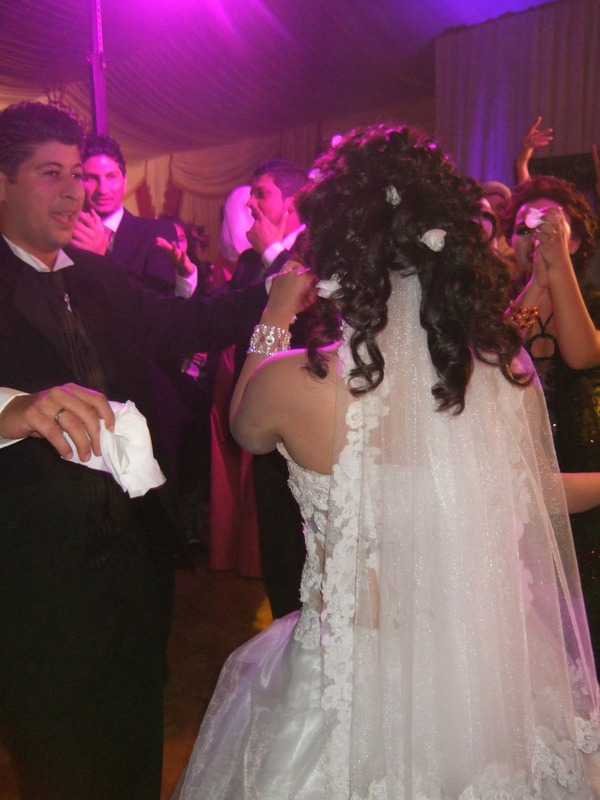 Unlike many American wedding ceremonies where couples find themselves hurtling through meetings with wedding planners, DJ’s, and pastors, Arabs make their way to the alter through a series of very structured, traditional steps. First the prospective bride and groom’s parents must agree to the marriage. Following this, the groom and his parents prearrange a visit to the home of the bride’s family where, in the presence of a religious sheikh, a marriage agreement called the “Aqed Zawaaj” is signed by the bride and groom, the bride’s father, the groom’s father, and two male Muslim witnesses. The marriage agreement stipulates that a fee, agreed upon by both parties, be paid by the groom to the bride as a gift. A portion of this is used to procure the essentials in any wedding: purchasing the bride’s extravagant gown, reserving the wedding hall, and outfitting the hall with flowers, and anything else deemed necessary for the auspicious occasion. This money also goes toward elaborate makeup and jewelry, which are both viewed as indispensable elements in any Arab wedding. Perhaps this speaks as much to the Arabic penchant to indulge in the pure exaltation of the marital bond as it does to the simple fact that women only weddings share an affinity with so many events born out of American celebrity culture: it is a place to see and be seen. The time between the signing of the “Aqed Zawaaj” and the wedding reception is typically several months, giving the couple time to get to know one another or court. Though, unlike Western dating, a chaperone, typically from the women’s family, remains present on any outing. In addition, the couple may not live together nor be seen alone together in public before the ceremonial wedding reception where the participants serve as witnesses to the marriage. Separate celebrations for men and women are normally held simultaneously on the wedding day. The wedding reception was held at the Ritz Carlton on the outskirts of Doha. I was awestruck by both the opulence of the room with its sparkling chandeliers and lush furnishings and the assemblage of women. Women spilled out everywhere, some whispering discreetly in each others’ ears or meandering through the room, reservedly and chastely kissing relatives or friends the requisite three times on the cheeks; others surveyed the room like fashion critics ogling guests on the red carpet. Amidst these assorted guests a core group presided over all of the guests, directing the sequence of events. I was enthralled, spellbound, and a bit unsteadied by the sheer spectacle. After wading further into the room, I noticed a three foot elevated platform with runway that traversed virtually the entire length of the room. Alongside the runway, a female singer keened to the accompaniment of musicians playing the tablah, or Arabic drum. Dotting each side of the extravagant catwalk were numerous round tables laid out with elaborate gold and burgundy place settings for dinner. A large golden rectangular pot with circular designs spreading from the base to the rim containing an abundance of colorful artificial flowers resided on each table. Ivory pillars rose from the elevated platform, sporting gold inlaid designs with a sequence of curves that melted into each other; burgundy curtains dripped between the columns. Gold and ivory colored stands with exquisitely crafted flowers bordered the stage. In the center, a red velvet loveseat awaited the bride and groom who would make separate entrances later in the evening. Laila, the mother of the bride, greeted me and my good friend, Sameerah, when we entered the room. Though I had met her several months earlier at a sheesha café in a newly renovated souk in Doha, I abruptly passed right by her in the ballroom, mistaking her for just one of the many bejeweled and gowned guests. Gone were her long black abaye and head covering. What stood before me now was a vision that could easily pass forHollywoodroyalty. Laila gazed at me with impeccably made-up eyes – hues of blue covered her lids and shimmering black outlined her exquisite ovals. A lavender dress clung to her curvaceous form that ended with a magnificent train; silver adornments glimmered in the artificial light of the luxurious chandeliers. Laila’s hair was piled high atop her head; delicate ringlets framed her face and cascaded along the side and back of her head. Struck by Laila’s splendor and extraordinary luminescence I felt at once wistful that these Arab women were not permitted to let their natural beauty radiate in this way more often, and yet I understood and respected the desire to maintain and honor the deeply ingrained traditions and customs that dictated their reality. In a constant state of frenetic, yet gracious motion, Laila played the roles of skilled director, choreographer, and consummate hostess; she indefatigably welcomed her guests and ensured that not only was everyone comfortable, but supremely happy—a staple of Arabic hospitality. After many years in the Middle East, I had undoubtedly become acclimated to seeing traditional Arab women enveloped in black, seemingly bereft of identity and barely present – one ebony form identical to the next. I had to squelch any outward signs of sheer disbelief at the exceptional beauty of the women collected in the room as Sameerah, the veteran of such gala events, coolly guided us to a table adjacent to the stage. We settled in amongst a throng of haute couture gowns with glittery and colorful embellishments (many with trains), plunging necklines, unconventionally stylish miniature top hats garnished with striking colors and glistening silver sequins rakishly tilted to one side, atop flawlessly coiffured hair. I met the eyes of many women, ringed with deep and rich shades of green and blue, their lids traced in thick sultry black liner. Henna scrollwork artistically ran up and down hands, arms, feet, and legs. I conspicuously surveyed my own couture gown, ornate multi-tiered silver necklace with matching earrings, and painstakingly applied makeup, and lost all hope of blending into this opulent jewel box. Not long after we entered the hall, the room began to pulsate with music blaring from mammoth speakers mounted to the walls. Along the stage, frantic, rhythmic drumming resonated in the room while a singer belted out traditional Gulf melodies at a pitch that strained every nerve ending. Several young women in the audience sprang onto the stage, leaping and gyrating along the platform simulating the traditional Gulf dance, a dance performed in countries along the Arabian Peninsula, in a zealous and ritualistic fever. I watched with a tinge of envy at the dancers’ sheer lack of inhibition and was brought back to an image of myself at that age, painfully shy, filled with a consuming dread when first asked to dance to the comparably tame strains of Chicago by my future husband in the bar of the Hilton Hotel outside the University of Florida campus. Sameerah caught my intent gaze, her eyes playfully prodding me to take the dance floor. We both adore dancing, but neither of us knew how to dance the traditional Gulf dance. I bit my lip and shook my head, not wanting to risk exposing my two left feet. My love of dance, however, won over my full fledged trepidation of not measuring up to these graceful and bewitching creatures. I could sense legions of eyes, laser rays boring holes through me as Sameerah and I made our way up the stairs to the stage. My gaze anxiously swept the platform taking in the hapless yet harmonious arm movements, inexhaustible and whirling hip action, pivoting shoulders and necks, and swirling fans of long, silky, coal black hair slicing through the air. Seizing the fleeting sympathetic smiles from compassionate observers, I desperately tried to imitate the mystical moves, willing my body to sway and whip in the same mesmerizing fashion to no avail. I finally succumbed to the more familiar belly dance that I had learned from my husband, his family, and other Arab friends, slipping comfortably into the oscillating circular movement of the hips and letting my arms billow out to the side, joyfully losing myself in the dance. Sameerah persisted heroically with a blended version of Gulf motions and belly dance. Our inspired, yet futile, efforts were met with charitable applause from the audience. Emboldened and giddy over the audience response, Sameerah and I made a second vain attempt at the nuanced movements of the Gulf dance. The most I could muster were inept leaps and helpless flailing arms. I felt challenging stares as my spirit deflated. Once at the security of our table, I caught a twinkle in Sameerah’s eye as she leaned over and whispered that she had overheard several of Laila’s inner circle comment that the westerner and her friend might prefer belly dancing over the more traditional Gulf moves. To our delight the next song was a Lebanese melody, perfect for belly dancing. Sameerah and I were back on the stage to the obvious appreciation of the audience. Several enchanting young children, fixated on their older sisters and cousins’ expert movements, gingerly climbed the stairs to the stage to imitate their revered kinsmen. From time to time, older women completely covered in black from head to toe, save for their worn eyes, made their way onto the stage to throw paper bills over the dancers. The scattered money would be collected at the end of the festivities to tip the singer and musicians. The bills twirled and fluttered across the stage in the same way the dancers cast their bodies about the platform. The women tossed out their money, cupping one hand over their mouths and crying out in shrill undulating tones. I was intrigued and baffled by the incongruity of the scene. Only moments before, these nondescript women shrouded in black had appeared devoid of personality. Now, they shared the stage with such dazzling, spellbinding figures. Both sets of women, generations colliding, drew the eyes of enraptured onlookers. Perhaps these women cried out in sheer joy for their younger sister, given over in marriage; perhaps theirs was also a wail daubed with mourning, recalling a time and place that was only a distant memory for them. Finally the time arrived for the bride, Fatima, to make her anticipated entrance. Muted sighs rippled through the room. A viselike grip throttled my senses as I caught sight of a vision in white satin floating past me on the carpet. Fatima sparkled in a resplendent white modern wedding gown and veil, her figure in full display. Her serene eyes gazed regally, deep pools of black framed by sumptuous multi-colored shadows and lids heavily laden with charcoal black eyeliner – an Arabian princess. With each step an attendant smoothed out Fatima’s intricately embroidered train while other ladies showered her in rose pedals. Fatima stepped up onto the runway and proceeded to the red velvet loveseat where she sat, composed, reserved, and glorious, with barely a smile. Around her, the scene erupted as many well wishers kissed, embraced, and congratulated her while photographers clamored to get their shots of this stunning beauty. The sight of the lone alluring figure surrounded by rapturous family and friends tugged at my heart; it was a most joyous moment and yet behind the beguiling eyes I sensed a young girl unsettled over entering a distinctly new chapter in her life, removed from the security of her family into the role of wife and mother. As I gazed upon this lovely bride, I silently shared her excitement and trepidation, willing a kind of mute solidarity with her and wishing her a life of happiness amidst inevitable challenge and change. The audience commingled, as fierce drumming accompanied by piercing intonations reverberated along the foundations of the hall. Fatima received her guests for nearly half an hour when a low murmuring filled the room. The mood shifted and a curious tension began to swell. The fluid and graceful movements of the dancers were exchanged for fitful and spasmodic gesticulations. Disquieted and fleeting glances ricocheted through the space, and an apprehension hung in the air. Flustered and unsettled, I furtively scanned the room, struggling to unearth the source of the unease. As if on cue, the aggregation of women stealthfully and nimbly masked their exposed skin with abayes and black headscarves. Sameerah tugged at my scarf and covered her visible kneecaps. The groom’s arrival, along with his father and brothers, and the bride’s father and male siblings, was imminent. Their entrance transformed the activity and energy of the room, bringing a sense of order and male authority to what had previously been an orgiastic celebration of women, pleasure, and decadence. The groom majestically and purposefully strode to the platform, climbed the steps, and made his way to his bride with the male family members dutifully following behind, faces implacable. 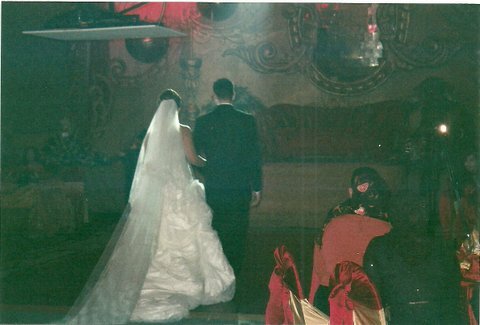 I caught my breath as a black curtain was draped around the bride. Sensing my bewilderment and consternation, Sameerah dropped her head and in a hushed tone divulged that custom dictated only the groom, his father, and the bride’s father and brothers were permitted to see and congratulate Fatima; she must remain out of sight of the other male members of the groom’s family. Camera flashes popped around the room like little sizzling bolts of lightning. The once divine and radiant bride became indiscernible to much of the audience, disappearing even further beneath the throng of family and friends who engulfed her in congratulations. By nearlymidnight, the male population had whittled down to its one distinguished member—the groom. Elsewhere, the illustrious gathering became briefly distracted and preoccupied with luscious culinary delights; a buffet laden with what looked like an infinite array of Lebanese mezzah – hummus, tabouli, fattoush, babaghanoush, moutabel; lamb, fish and chicken skewered or braised in rich sauces and garlic, swimming in copious measures of parsley and mint, and flat, oval leaven bread piled high in baskets. This was followed with indulgent and heavenly Arab sweets; baklava, knafeh, and mabroumeh. Trading snatches of conversation over the wonderments of the evening, Sameerah and I put our heads together like excited school girls, feeding our bodies on the sumptuous cuisine and our minds and spirits on the remarkable celebration. Sameerah and I decided to forgo the dancing and celebration sure to continue unabated through the wee hours of the morning. We would collect our tired, but happy bodies and ruefully wonder what twinges or aches might greet us in the morning, the physical souvenirs of such a spirited evening. Shortly after midnightthe bride and groom unobtrusively made their way to the door amongst a cluster of attendants. 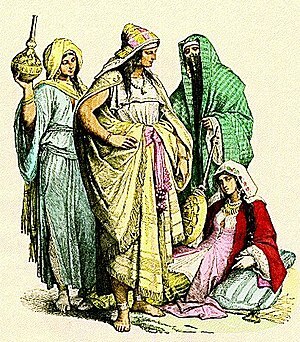 Before exiting, several women delicately cloaked Fatimawith an abaye and black head covering. This alluring Arabian jewel, like so many others, would now be just another ebony silhouette amongst the featureless masses. But not to me; I would know differently. ** Both photos were taken at mixed-gender Arab weddings, as it is prohibited to take personal photos at “women only” weddings. The shopkeeper lightly tapped her pencil on the edge of the order pad, a strained, polite smile pasted to her face. I was a newly engaged, first time bride living in Washington, DC,and purchasing a wedding dress was only one of the many, many details that was making my head reel. There was still a church and pastor to secure, flowers to choose, a photographer to hire, bridesmaid dresses to pick, and I hadn’t even looked at the different menu options for dinner. In contrast with many of my American girlfriends, I was considered a “tomboy” who lacked interest in typical female activities such as shoe shopping or, well, planning an entire wedding. But I quickly realized and accepted that this was part of the excitement and exhaustion of being a Western bride: with nearly limitless choices, you could spend half a lifetime making all the plans and preparations for a wedding tailored to your unique cultural or personal tastes and sensibilities. I, however, like many brides, only had a few months to prepare for “the big day.” Inhaling I pointed to the satin beaded gown. Sharing in my evident relief, the shopkeeper broke into a wide grin and began to take down all the necessary information. My travels and experiences living abroad in Saudi Arabia and currently Qatar may have taken me far away from that heady time as an American “nearly-wed,” but I have discovered on my journey that there is an anxious and charged bride-to-be awaiting her unique day of celebration in every culture. In contrast to the west, the course to the altar for the Arab bride runs less like a disorienting maze and more like a well-lighted, sturdy path. Their journey begins with the suitor and his family visiting the home of the prospective bride to assess the feasibility of a match; this is followed bythe Khutuba (Jaaha), or the engagement ritual,and the Melcha(Aqed Zawaaj), the marriage agreement, where family members play pivotal roles,culminating with the wedding celebration where the attendees serve as the witnesses to the marriage. Western wedding ceremonies, alternatively,are particularly known for their diversity in both content and execution. Many couples follow religious doctrines and their prescribed rituals very closely, adhering to all the principles and rites, while others create celebrations around customs that hold personal meaning. Some adopt their own creeds taken from different spiritual or secular sources such as poetry, literature, or music. Likewise, the wedding ceremonies themselves take on various shapes and sizes: traditional church services, simple backyard affairs, civil ceremonies at county courthouses, abbreviated nuptials in Las Vegas, and even lavish “over the top” celebrity weddings held in exotic locations and costing millions of dollars. American weddings literally acquire just about any form, from the conventional to the sublime,whatever suits the couple’s particular tastes and desires. The months prior to the wedding celebration bring a flurry of activities, events, and final preparations for both Arab and western brides. During the time of the ArabKhutuba (orJaaha)and Melcha (Aqed Zawaaj), it is often customary for the groom’s family to bestow a wealth of luxurious items on the Arab bride such as pieces of gold and ornate jewelry. On the other side of the world, in the U.S., female family members and friends assemble for the “wedding shower” in order to lavish the American bride with gifts that are usually more utilitariansuch as dishware, utensils, blenders, toasters, or bed sheets. Whilethe American bride has her own unique concerns over coordinating thearrival of relatives from out of town and attending traditional gatherings such as the bridesmaid’s luncheon, “women’s night out,” and the rehearsal dinner, the Arab bride and her family and friends are consumed with their ownlast minute details surrounding the elaborate affair in the days prior to the wedding. My husband, Bishara, and I married in our mid-thirties, not an unusual age for American couples, yet considered “over the hill” for our Arab counterparts. Due to the increasingly common practice of marrying later in the U.S., many American bridal couples tend to be financially independent and, thus, better equipped and content to handle planning and paying for their own weddings. Western family members, therefore,may not play as integral a role in every step of planning the wedding. Arab families, on the other hand, are quickly immersed in all elements of the marriage nuptials, includingthe earliest part of the wedding ritual: the Khutuba (or Jaaha). 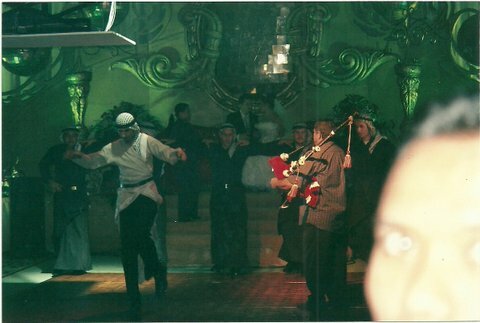 In Spring 2008, my husband, who is of Lebanese descent, was fortunate enough to attend his first Arab Jaaha, a ceremony in which close male family members and friends of the bride and groom, along with a religious sheikh, assemble at the home of the bride’s father to formalize the engagement of the prospective bridal couple. With the bride’s father sitting solemnly on one side, the father of the groom settled on the other side, and nearly a hundred male guests sitting in a large circle, the sheikh began the ritual with words of advice to the groom, and audience, on how to have a successful and happy marriage. While my husband and the other men were at the Jaaha, I gathered with a cluster of women and children, including the mothers of the bride and groom and other female family members and friends, at a nearby ornately decoratedcompound clubhouse where we danced and sipped aromatic cardamom coffee. The occasion culminated with the shrill undulating intonations from several of the women erupting into the night air, signaling the arrival of the bride, groom, and the male relatives and friends. 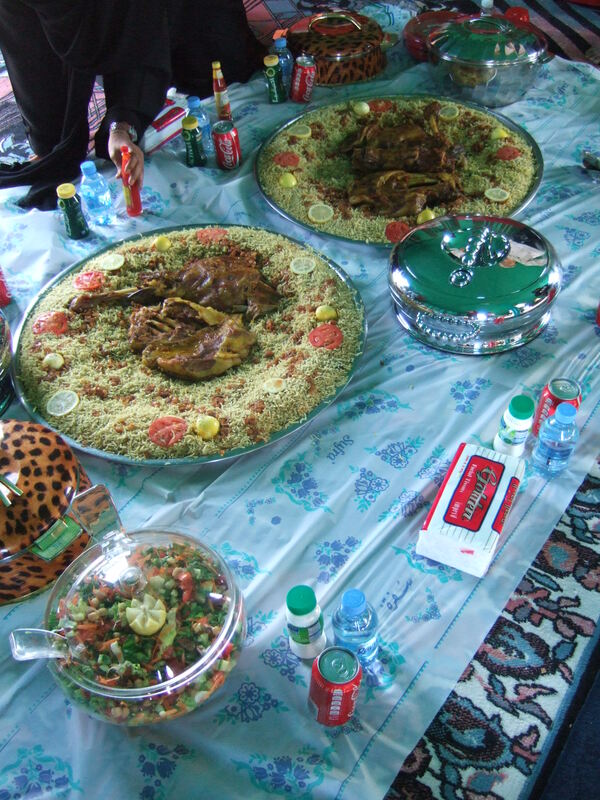 The gathering, expanded with the arrival of men, became a spirited celebration; the guests feasting on an assortment of catered food, mounds of lamb and rice and Lebanese mazah, and dancing to popular Arabic music. My husband and I also had the good fortune to attend an Aqed Zawaaj (marriage agreement) ceremony, segregated by gender, for a young bridal couple in early summer 2008. 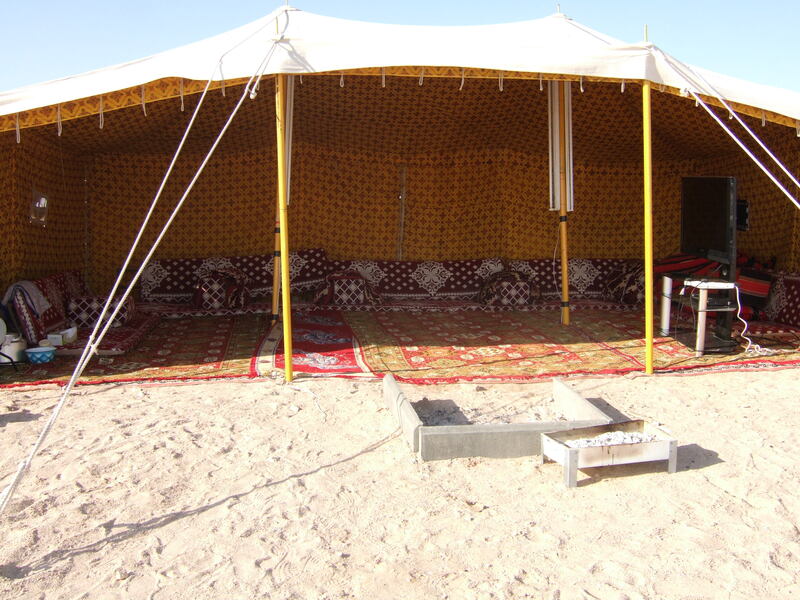 The traditions surrounding the Aqed Zawaaj mirror the Jaaha, with the exception that the Aqed Zawaaj concludes with the signing of the wedding agreement by the bride and groom,relevant family members and witnesses. When the marriage was officially announced, female relatives and guests in the adjoining room cupped their hands to their mouths, producing the familiar high-pitched undulations as mother and sisters of the groom chanted good wishes for the bride and groom. This unique gathering of family and friends is immensely moving and serves as a lasting reminder of the way wedding celebrations across cultures are distinct opportunities to recognize these poignant and special life moments. The special roles and close familial relationships in the Arab world continue beyond the wedding rituals and final celebration. At gatherings of family and friends in homes spilling over with companionship and spirited conversation,in-laws are referred to as Uncle (Amo) and Aunt (Khaltie). In-laws are actually considered to be a second mama and baba to the new couple, tending to create strong family bonds. There have been few instances in my life where I have witnessed such unrivaled veneration of matrimonyas when I attended another type of wedding ceremony common in the Arab world: a “woman only” wedding. 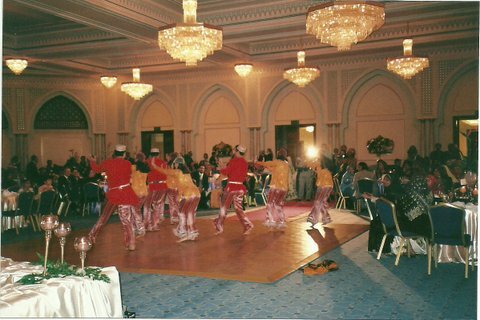 In early Fall 2007, I was delighted to receive an invitation to one of these lavish events taking place in Doha, Qatar. Half expecting to be met with a sea of women enveloped in black abayes, the galawas instead a sensational display of couture-worthy evening wear, beautifully coiffured hair and exquisitely made-up faces that rivaled the work of the finestHollywood make-up artist. Spirited live drumming combined with recorded music and captivating Arab Gulf dancing became the evening’s celebratory backdrop. I was hardly accustomed to seeing such fashionable attire at the many American weddings I had attended. 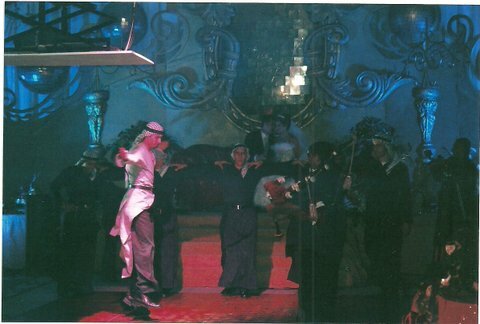 Despite wearing one of my finest ball gowns on this glitzy evening in Doha, I had definite concerns about “not measuring up.” Upon entering the luxuriously decorated hall, I was awestruck at the splendor of the surroundings and the participants as well as at the hospitality of my Arab hostesses. The bride’s lone entrance marked the pinnacle of the celebration at my first “woman only” wedding on that warm Fall evening; she was a vision in white satin and regally ascended the steps of an elevated platform where she sat on a sumptuous loveseat engulfed by the kisses, embraces, and congratulations of well wishers. She seemed serene, reserved, and glorious occupying the center of attention. I found myself captivated by this beautiful and resilient young bride, sharing in what I imagined was her nervousness and excitement on this particular day. Mary,a British expatriate friend noticed this phenomenon and remarked: “The main difference from a western wedding is that most of the evening is segregated and there’s more focus on the bride; she literally takes center stage and has the chance to shine while everyone admires her hair, makeup, and dress. Towards the end of the evening, there’s a buildup of excitement as everyone waits for the groom to arrive. It certainly makes for a most interesting event!” Women only wedding celebrations normally stretch out in vibrant revelry into the sleepy hours of dawn. Many times, American weddings also serve as events that unite family and friends who are scattered across different regions of a vast country. Generations convene around this moment, welcoming new members of their family and reestablishing meaningful ties. Across the globe, wedding ceremonies are more than joyful occasions or celebrations. They are important rituals that honor the forging of community out of disparate factions, serving as hopeful reminders of the power of unity and harmony. This is the unedited version of my article, “In Transition,” published in ‘The Woman’ (magazine supplement of Qatar’s ‘Gulf Times’), October 2010 edition. It is one of three articles that profile five young Qatari women, four of whom are attending universities at Education City in Doha, Qatar, including Northwestern and Virginia Commonwealth, and the fifth who is attending Swansea University in Wales. This article focuses on how these young women of the Arabian Peninsula balance the “creep of westernization” with age-old traditions and customs, particularly with regard to negotiating career/marriage/family and gender issues. Fatma, currently attending Northwestern University at Education City in Doha, and a recent graduate of the Academic Bridge Program (ABP) at Qatar Foundation, is one of five young Qatari women I interviewed for a series of articles about their educational experiences and views on the culture of the Arab Gulf region. With the focus on family such a crucial element of the social fabric, women like Fatma represent a bold change in tradition in their willingness to consider making career a priority before turning their attention to child rearing. Mouza Abdulaziz pointed out that a college education and career can provide insulation against the uncertainties of life. “I’d rather have my degree and ensure a good life than getting married to someone and suddenly something might happen,” quips Mouza, a poised 18-year-old and outspoken girl studying journalism at Northwestern University in Doha. Sherifa Hammam shared the desire among the women to finish their studies before marrying. “For me, I am a person who likes to do whatever I want. If something is interesting to me and it’s really going to be helping me with my resume, I would like to do it.” Sherifa isa student at Swansea University in Wales, studying law and business. She acknowledges that she would not mind giving birth to children, two children to be precise. “I love them [children], but they give me a headache,” she said innocently, causing us both to chuckle. The lessons and examples created from strong family ties inform the girls’ views on their own foray into motherhood. 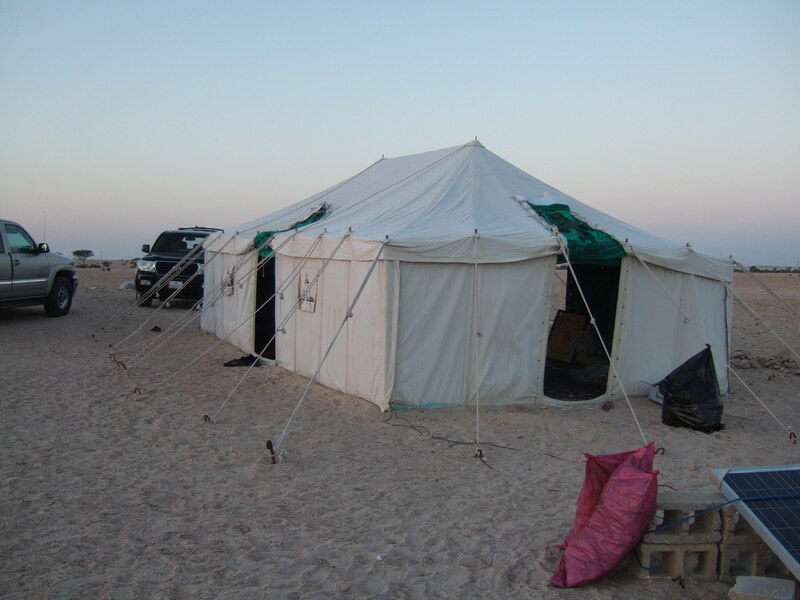 It is not uncommon for Qatari families to have six, or more, children living under one roof. Extended relatives — aunts, uncles, cousins and grandparents — usually live nearby in either a communal compound setting or within blocks of their immediate family home. “We usually visit each other often, and our first friends are our cousins,” Mouza states with noticeable affection and gratitude. Most of the girls echo Mouza’s sentiment, citing various family members as particularly influential in their lives. The girls fell silent for a moment, perhaps mentally tracing the outcomes of their answers. Sherifa broke the lull. “Of course, a man,” she offered. “I could marry four women.” The rest of us couldn’t help but laugh, as Sherifa broke into a toothy grin.